captbrando's log » Blog Archive » The A380! This entry was posted on Wednesday, August 20th, 2008 at 7:05 pm	and is filed under Moblog!. You can follow any responses to this entry through the RSS 2.0 feed. You can leave a response, or trackback from your own site. 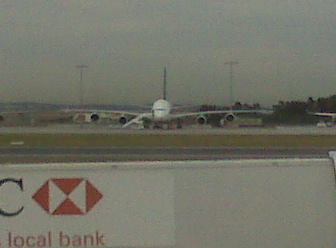 oh man, i’m DYING to get on a 380!! it was big news back in my airline days, but i left before they got one in PHL that they got to tour. also, i just tried to register so i could comment, but it brought me to your dashboard? so i may have accidentally hacked your blog instead. oops. you are such a hacker!